So I live in Uttarakhand & the husband decided to take me along on one of his work trips to the hills. Though not a fan of the winding roads that you must go on to get there, I’m a big lover of mountains & the cold. Having lived in Chennai for almost all of my life, you can imagine how ridiculously excited I get about any weather below 20 degrees C! It was April and the summer was just starting to set in in the plains, but the hills we heard were still a little chilly. Aside: Never take at face value the judgment of a pahadi on what “little chilly” refers to. More on that later, though. It was to be a three day trip covering Pithoragarh, Almora & Kausani, in that order. We started bright and early at around 8-ish from Rudrapur, estimating that it would take us around 5-6 hours to reach, not including stops. You would be well-advised to pack up your own food basket, because the options for food are not great on the way up. We found a small halwai where we ate decent chole-bhature and massive aloo parathas. These are extremely popular breakfast items in this part of the country, to be enjoyed with a hot cup of chai. We though, had them with badly made machine coffee. Ugh. Breakfast done, we drove on and started to climb up at around 11-ish. And here begins the WORST uphill drive of my life (and I’ve had a fair number of them, mind you!) To call what we were driving on roads, would be a gross exaggeration. We felt like gumballs in a gumball machine – you know, when they’re hurled all around that dome! To make things worse, we didn’t even have a view. It was all dry and barren and so not pretty. We bravely chugged on, not daring to stop for lunch because it would soon be out of our tummies, and not in a good way. We made it to Pithoragarh in one piece, at around 4.30 PM, haggard and ravenous. We stayed at the Pine Resort, just outside town. We were pretty satisfied with our accommodation – huge room & bathroom and very neatly kept. Food-wise, we decided not to take any risks and stuck to having simple Indian food – roti, dal etc., which turned out be a good decision. We were meeting a few of the husband’s associates for dinner. For this, I dressed in my summer clothes, cockily thinking that I could handle a bit of chill. And then I stepped out. A “little chilly” in pahadi terms means a temperature of about 10 degrees C! We, fantastic that we are, hadn’t brought ANY winter wear. Thankfully, the place we went to for dinner, a dhaba style restaurant in the military area of Pithoragarh, had indoor seating. Here, we had the usual punjabi fare – naan, a couple of paneer gravies, kaali dal and topped it off with a homemade kulfi, which was actually nice! Next up: Almora. It takes between 2-3 hours to get to Almora from Pithoragarh, so we left around noon after a heavy breakfast as options for food on the way were few and far between. Thankfully, the roads were much better this time and we had quite a nice drive with a great view. We stopped at a tiny dhaba for lunch – only because it was recommended, otherwise it looked super shady! We ate what has by now become our staple meal – naan & kaali dal again! We got to Almora by around 4 and checked into the Hotel Shikhar, which is said to be the best place to stay there. It was an okay-ish hotel but what I found quirky about it was that the the reception/lobby was the top most floor and you had to go DOWN to get to the rooms! The place seemed to be undergoing some renovation of sorts, so parts of it were a mess. Otherwise, the room etc. was okay – you could stay there a night and make do. We mostly chilled in the room & decided to take a walk later in the evening around 8-ish. It seems to be the norm in the mountains for everything to close early and this was no exception. There were hardly any shops open and I could spot only one or two other women apart from me on the streets at that time. Both Hubs & I felt that we were getting odd stares, so we quickly hurried back to our room. We didn’t really get to explore Almora much (there’s a ghanti wali mandir here) and headed off to Kausani the next morning. The awful part about tagging along on business trips is that a lot of times the husband actually has to work and I have to sit around reading Game of Thrones endlessly (not complaining). This is exactly what happened as we headed off to Kausani, only an hour and half’s drive from Almora – we stopped over for a “quick” meeting which went on for 4 hours. Well, at least I finished my book. But, but. Kausani! The drive up there from Almora is completely beautiful. You have a very scenic view of lush, green terrace fields gently rippling with the wind. As you go higher, the air gets fresher & fresher. You just never want to leave! As you drive into the town and up to the resorts, you’re welcomed with a breathtaking view of the Himalayas. And in our case, it was even a little hazy but amazing nevertheless. We wanted to stay at the Sun & Snow Resort but it was all booked (we hadn’t made reservations, strongly suggest that you guys do!) so we went on to stay at the Krishna Mountview. The rooms are tiny but cosy and there’s a little balcony with a spectacular view at which you can lounge around, have breakfast etc. (they have great food and especially great finger chips!). 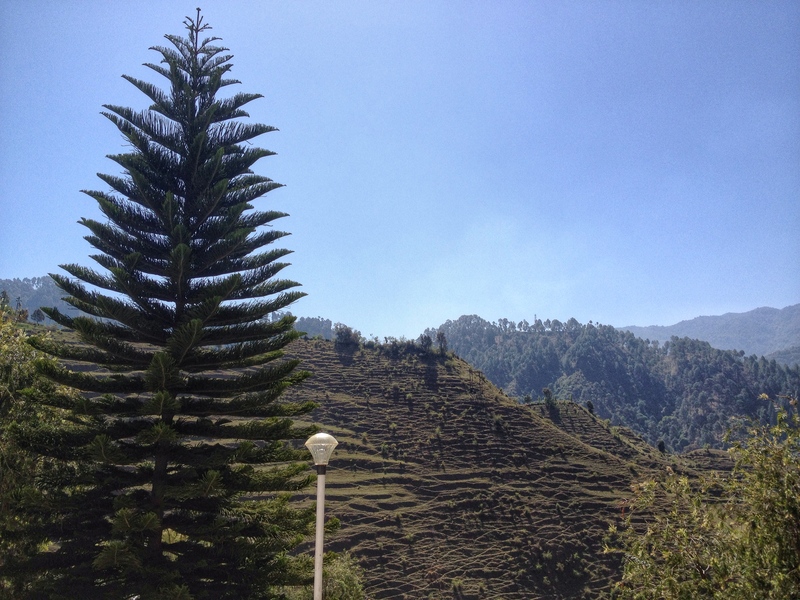 It was much colder here than even in Pithoragarh and we only dared venture out in the balcony when the sun was up. And when we did, we saw peaks and peaks in glorious clarity, with nothing to mar it. Magical! We checked with the hotel staff about the best time to visit – they recommend coming in October where the view is always clear and you can see the entire range even at night by the moonlight. We’re definitely making a trip back here around then! 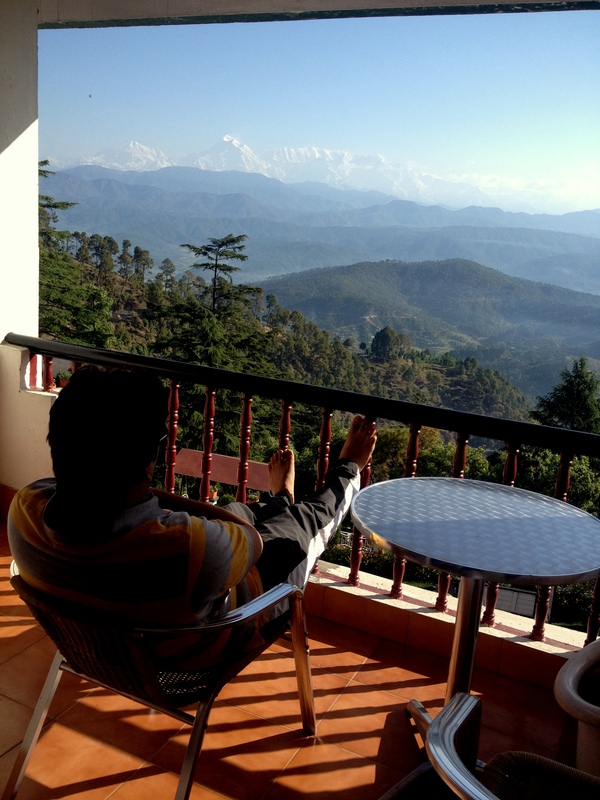 Hubs taking in the view from our balcony in Kausani! Phew, quite a long one this was. Those of you who got till there, thank you for reading! 🙂 I’m still finding my feet with this form of writing and I would really appreciate it if you took the poll below to tell me if you’re interested in reading more stuff like this! Of course, if you’d like to be more verbose, comment away! Also, more pictures next time, I promise!